Mosa μ rewarded with Red Dot Award » Mosa. Tegels. 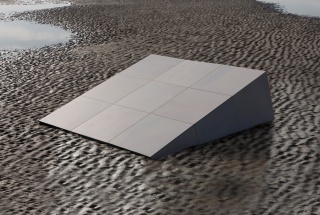 Mosa’s latest tile series, Mosa μ [mu], has won a coveted Red Dot Award. The new product, which was launched this April, was applauded by a jury of experts – around 40 independent designers, design professors and specialist journalists – for its innovative approach. The Dutch ceramics manufacturer’s Mosa μ concept is inspired by the extraordinary relationship between light and the color spectrum. Mosa’s Design Team also looked at nature, art and trends in architecture, as well as ancient Greek philosophers’ visions on the subject. The result is an unprecedented, truly dynamic experience that stood out among this year’s nominees. Playing with ceramic pigments and the way they interact with their environment and with each other, Mosa created a series that is able to subtly change its appearance, depending on its surroundings. The Mosa μ surface is designed to respond to space and the fourth dimension - time, taking its cues from a room’s interior features and the changing light during the course of the day. Coming in a single size – 24 x 24 inches - and four main shades - white, light grey, grey and brown - Mosa μ tiles can truly transform the way we experience space. Recognizing Mosa’s dedication to ground-breaking products that are both conceptually strong and technically excellent, the Red Dot Award’s committee praised the Mosa μ series for its outstanding design and material quality. This honor is one more feather in the cap of the tile industry leader, whose other accolades include several previous Red Dot Awards, as well as IF Awards, Interior Innovation Awards, Design Plus Awards, Good Design Awards, and Dutch Design Awards. Mosa will receive its trophy in the Red Dot Design Museum in Essen on July 3rd 2017, during the Red Dot Gala award ceremony, a joint event for all the Red Dot category winners. The Red Dot Design Yearbook 2017/2018 will be available on the same date.